The sales process has taken on almost mythical status, with consultants and presenters around the world promising that they alone have the best trick for consistently closing sales. While their hacks and tips may be helpful, success starts with a solid foundation—in this case, the five-step sales process. What is the 5-step sales process? The five-step sales process is a simple, linear approach to selling. The process begins with initiating contact with the client and ends after a salesperson closes the deal. While different salespeople and different products may necessitate a more detailed or uniquely tailored process, the five-step sales process provides a strong foundation to work with. Once you’ve mastered the five-step sales process, it will be much easier to adapt your sales approach. Using a five-point sales process takes the guesswork out of sales. If you have a defined process, you never have to worry about what to do next. And you’ll be able to easily adjust your process if you notice that your sales process consistently stalls at the same step. What are the 5 steps of the sales process? The nature of the approach varies according to your sales method—for example, you’ll never so much as see your client in phone sales, whereas you’ll want a firm handshake ready for in-person sales—but this first step is all about building a relationship. Begin by introducing yourself and explaining why you’re contacting them. You might remind them that they indicated interest at a conference you both attended or note that someone else referred them to you. This explanation puts you both on the same page. Use this first step to make a good first impression. Look for opportunities to connect with the client, such as discovering a mutual interest. Be positive and genuine as you initiate conversation. You want the client to feel comfortable talking with you as you enter the second step. The client should do most of the talking in this step. You should ask questions that will help you understand them, but ensure you spend your time listening rather than thinking of what you’ll say next. Use questions that encourage the client to talk about the problem they’re having that your product can solve, but don’t bring up the product yet. Try to get them to talk about their motivation for fixing the problem, other solutions they might have tried, or concerns they have about potential solutions. You should also ask questions that will help you anticipate objections. Do they have a budget? Are there other constraints you should know about? Ask follow-up questions as needed to clarify. At the end of this step, check for understanding. Tell the client what you understand their needs to be and ask for verification. If you’re on the same page, then proceed to the next step. Otherwise, continue asking questions until you understand. Lucidchart could help you visualize and then easily verify the information that a potential client has given you. For example, McClain Smith from the Lucid sales team used Lucidchart when he sold video interviewing software. He would share his screen and diagram the client’s current interview process as they explained it—and the client could see immediately whether McClain understood the process. Then McClain created a new diagram to show how the process might work if the client purchased the software. Now that you know the client’s needs, you can introduce a solution to their problem. Refer back to the needs they identified as you introduce your product. For example, if they explained they need a solution ASAP, emphasize that you can offer quick delivery. Explain how your product satisfies their needs and solves their problems. Depending on the nature of your interaction, this step is a good time to bring in aides to help you discuss your product. 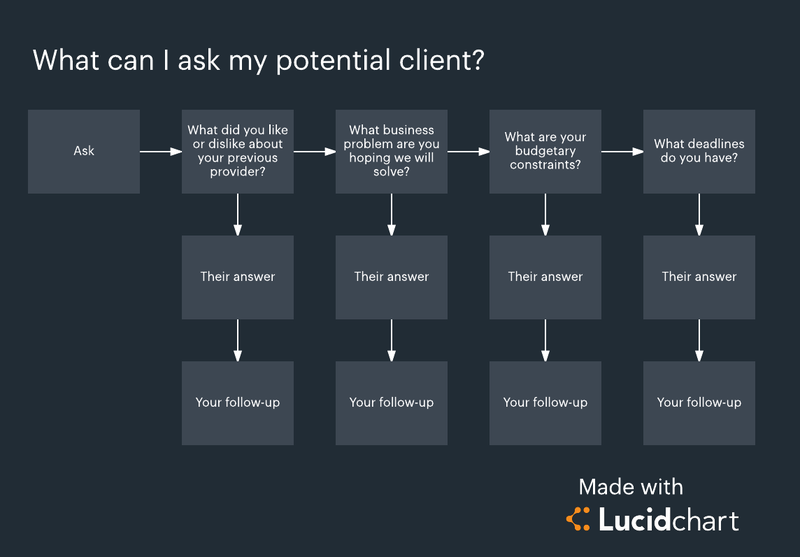 You might provide the physical product you are trying to sell, or just like the example above, you might present them with a diagram explaining your service (you can use Lucidchart to make this diagram simple and attractive). Ensure that any aides you use enhance the client’s understanding rather than distract them from what you’re saying. While you should certainly demonstrate your product’s value in this step, don’t oversell it. Be fair and honest in discussing how well it meets their needs. Your specificity should make it clear that your solution is a perfect fit for their problem, so there’s no need to make promises you can’t deliver on. Once you feel you’ve adequately addressed how your product meets the needs identified in step two, proceed to the next step. Make the sale in this step. Ask for their order or purchase. If all goes well, they’ll commit, and you’ll leave the interaction mutually happy. Of course, clients often will raise objections at this point, particularly when it comes to price. Remember the information they provided you in step two, and use that to respond to the objections they raised. You should know what they value and what’s important, and you can use that knowledge to overcome any objections. By the end of this step, you will have completed a successful sale. You and the client should have a mutual understanding of what happens next (delivery or other fulfillment). In this final step, fulfill their order and touch base with the client. Ensure the client gets their product as planned and that they’re satisfied with their purchase. Offer your help, should they need it, and invite them to contact you with questions. While the sale may have already been made, this final step opens a door for future sales opportunities. A satisfied client is more likely to become a repeat sale. Likewise, you can use this step to ask for referrals. 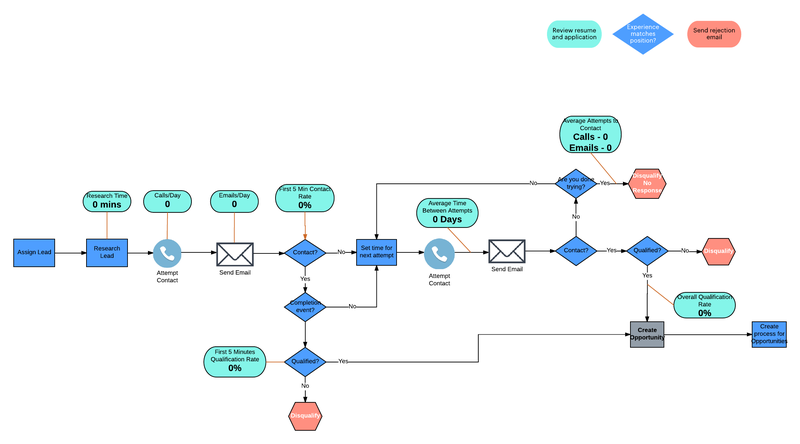 As you use your new connections to generate further leads (and use Lucidchart to track them), you will begin this five-step sales process again. While the basic five steps of the sales process are simple, your personal sales process may vary. 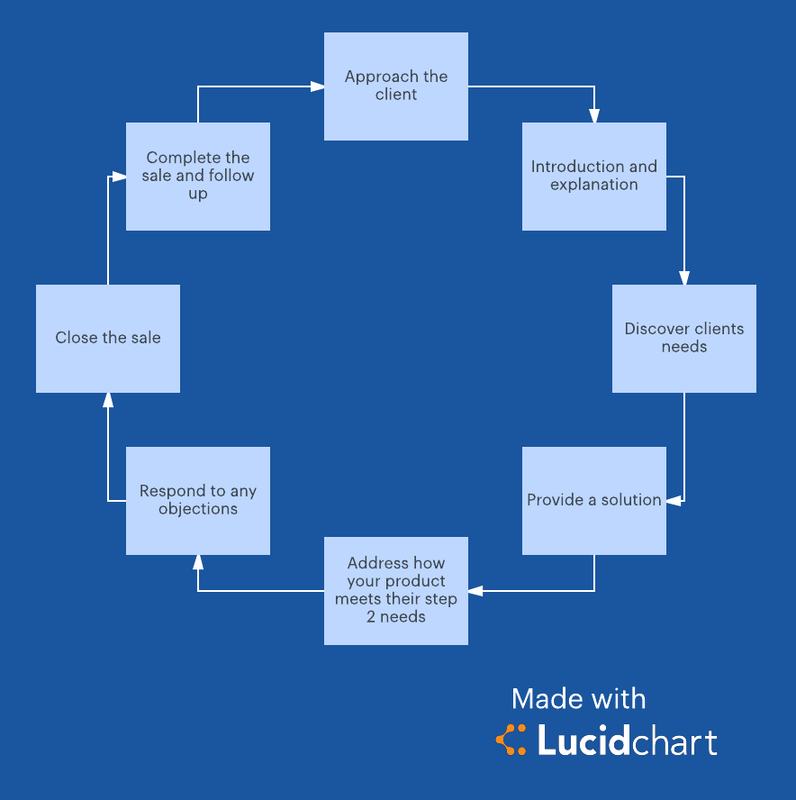 Use Lucidchart to map out your personalized process. You can create a flowchart to prepare yourself. Map out what you will do if the client objects to price or what you’ll do next if they don’t want to commit immediately. This preparation will help you anticipate and overcome roadblocks. You can also use it to train individuals selling with you. Likewise, consider using Lucidchart to cleanly and clearly present your product in step three. An informative and easy-to-read diagram will help clients understand your product better, and the advance preparation reflects well upon you as a salesperson. As you master the five-step sales process, you’ll be able to perfect your personalized method and make sales simpler than ever before. Try it today!